Last month Pablo Casado was elected leader of Spain’s People’s Party. His project: to use Reaganomics, flag-waving nationalism, and a war on feminism to reinvigorate the Right. This summer marked the end of conservative leader Mariano Rajoy’s eight-year spell as Spanish prime minister. His downfall became inevitable on May 24 as Spain’s high court condemned his People’s Party (PP) for its involvement in a kickbacks scheme spanning three decades. This so-called “Gürtel” corruption case, which ended in the imprisonment of several Rajoy allies, not only spread shock among ruling conservatives but also created a window of opportunity for the opposition. The Socialist PSOE called for a vote of no confidence in parliament and proposed its own leader, Pedro Sánchez. to form a new government. On June 1, the PSOE together with Unidos Podemos and the Catalan and Basque nationalist parties were finally able to drive the PP from office. This motion was driven not only by the corruption scandal but also a wider political deadlock fostered by the tensions over Catalonia’s constitutional status. Since then, the Spanish right has fallen into crisis. The Rajoy government’s main ally had been the neoliberal-nationalist Ciudadanos, a party experiencing strong growth in recent months off the back of its tough stance against Catalan independence. However, it decided not to take sides in the battle over the corruption scandal and seems to have lost direction. For its part, as it headed into opposition the People’s Party also had to confront the problem of how to replace Rajoy as leader. The party’s solution was to hold a two-stage primary, with PP members selecting two candidates who then faced off at a special party congress. The ultimate winner was Pablo Casado, who defeated Rajoy ally Soraya Sáenz de Santamaría by over fifteen points. This marks a considerable change of course for the party, and indeed a shift to the Right. In his campaign, in which he rallied support from elements of the party loyal to former prime minister José María Aznar, Casado appealed to the conservative base with simple and ideological answers. In particular, he rejected any strategy for dialogue with Catalonia and spoke of the need to win back disappointed People’s Party voters who had left in favor of Ciudadanos or the far-right Vox. Just thirty-seven years old, Pablo Casado has become the youngest leader of any of the big parties in Spain. He was already well-known as a TV spokesperson for his party on programs like Saturday-night talk show La Sexta Noche. He has also had a long political career, having been chief of the Partido Popular’s youth section in Madrid, director of former prime minister Aznar’s office, and cofounder of the Zionist “Friends of Israel Initiative” think tank. As everybody knows, Casado is no political novice. However, he is well aware that he has to speak to a society undergoing rapid change, and that he probably represents his party’s last chance to renew itself. His primary campaign was based on the message — repeated every day since he assumed the leadership — that he is the new hope for the Right because of his ability to connect with the best part of the country and the party itself (as his slogan puts it, “The People’s Party is coming back”). His historic mission is to fix this great party of the Spanish middle class in a postcrisis context. He wants to revive Aznar’s own project of forming an ideological rallying point that stretches from the center to the far right. However, he faces two obstacles in this mission. First, a scandal over his Master’s degree. Second, the challenge from Ciudadanos leader Albert Rivera, his political twin, over the leadership of the Spanish right. Casado’s weakest hand is the affair surrounding his Master’s degree. He faces a judicial investigation over his Law qualifications from the University of Rey Juan Carlos where, it is alleged, there has been a vast web of corruption that helped PP members in their academic careers. It is alleged that Casado obtained his Master’s without attending classes or submitting the normal number of papers. It is worth noting that Cristina Cifuentes, the former head of Madrid’s regional government and a figure involved in this plot, has already been forced to resign from her position. Casado also has to deal with the challenge to the PP coming from Ciudadanos, a party that defines itself as liberal and pro-European. Its leader Rivera, himself a former member of the PP, is Casado’s biggest rival on the right of Spanish politics. Both were born after the 1978 constitution was enacted, studied Law before starting their political careers, and today represent the ideal of a new urban middle class. Both adopt the posture of the “strict father”: the paterfamilias serving as a leader and moral authority who protects his family from a competitive, conflict-ridden, and dangerous world. It is worth emphasizing a key sociological difference between these twin heirs of Aznar’s project for the Spanish right. 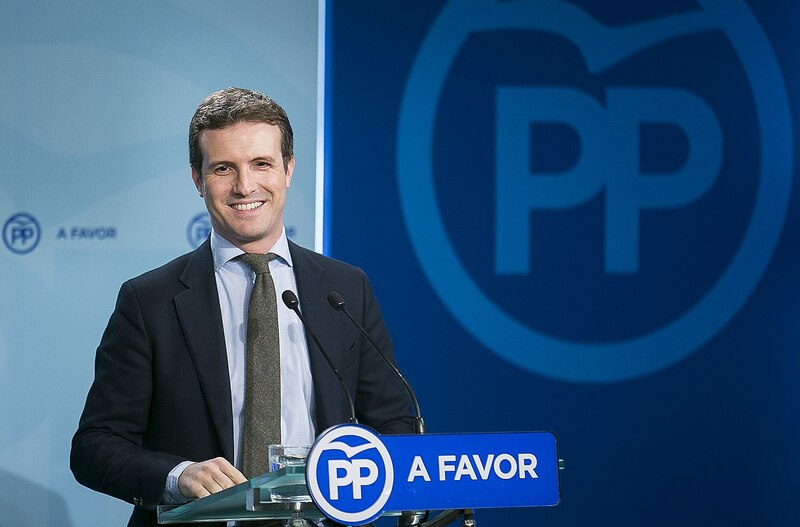 While Rivera comes from a working-class neighborhood in Barcelona, his rival Casado was born in Las Navas del Marqués in Palencia, a small town in what is today called “Empty Spain.” This town symbolises a ghostly, rural, and less-dynamic Spain; the areas in which the PP still wins absolute majorities. Lastly, both are clear about who they believe are “their people” and who Spain’s enemies are. Casado’s strategy for reasserting his party’s position and blocking the challenge from Ciudadanos consists of a very old technique: putting the Catalan issue back at the center of the political agenda and insisting that the memory of the victims of ETA terrorism represents a moral and symbolic legacy central to Spanish democracy. In times of uncertainty and political tension, going “back to basics” is an attractive strategy to fall back on. After eight years of Mariano Rajoy’s leadership (the so-called Marianato) Pablo Casado symbolizes the return of the party’s neoconservative soul, inspired by Reagan and Thatcher, as well as the assertion of traditional Spanish values. If some have speculated that in national elections Casado will depart from the line he used during the People’s Party primaries, this clashes with his broader political project. It seems more likely that he will maintain his fundamental ideas and alliances, building a new hegemony from the Right in his quest to form a government. Casado explained in a recent interview that if traditional conservative parties are unable to renew, new leaders or outsider movements would emerge to represent the citizens who feel forgotten. To illustrate this point, he invoked the two very different examples of Donald Trump in the United States and the triumph of Emmanuel Macron’s En Marche vehicle in France. After the global financial crisis and Spain’s own economic malaise, the two-party system and the whole of the political class have become the focus of a dissatisfaction felt among a large majority of Spanish citizens. This majority was importantly represented by the 15-M movement, most starkly represented in the square occupations of 2011 led by young Spaniards. If widely seen as a movement with progressive aims, for Casado this movement was at heart “a capitalist revolution,” motivated by a new generation of young people who wanted to live better than or at least as well as their parents. Some have drawn the link between this approach and the words of Andalusian Socialist leader Susana Díaz, when she referred to the “indignados” active in 15-M as people who just wanted a second apartment at the beach. Yet his approach is diametrically different. Where she tried to mobilize the poorest Spaniards’ envy toward supposedly frivolous middle-class youth, Casado has repainted the movement in neoconservative colors. As time passes, it becomes easier to recast 15-M in this manner and ultimately neutralize it in order to reach the conclusion that “there is no alternative” to the current political and economic system. More central, however, is what Casado calls “the Real Spain.” This is the section of the population that filled its balconies with Spanish flags at the height of the Catalan crisis in 2017. A kind of reactionary 15-M began to unfurl flags across every corner of Spain. All these people, united by their country’s national symbols, were reacting against a common enemy (the Catalan independence movement), but they had very different motivations and forms of expression. Historically, every form of right-wing populism in Spain has necessarily been built on the fight against some “enemy within.” Casado has proposed the criminalization of any debate on Catalan independence. Nonetheless, Casado´s approach also consists of a more proactive agenda, seeking to transform the fragments of “the Real Spain” into a new “moral majority.” Like Reagan, Casado seeks the support of the majority of Spaniards who defend certain “common sense” ideas not widely considered right-wing or left-wing, such as family, traditional values, and the unity of Spain. However, he knows that this majority will be built on the most conservative sectors of society. In this vein, Casado has outlined a conservative agenda in conflict with the more progressive impulses in Spanish society. Firstly, he has launched an attack on the feminist movement, which he calls “gender ideology” and terms a form of “social collectivism,” as it tries to divide society by categories like gender and forgets that the most important thing is the individual. According to this neoconservative perspective, feminism is the vanguard of a contemporary left that is today unable to propose a political, economic, and social alternative to capitalism and so instead seeks to transform everyday life. In this view, recent progressive measures must be reversed in order to give voice to the silent, moral majority that uncomplainingly follows the law. Casado has moreover attacked the current law on abortion and possible reforms regarding the law on euthanasia. He employs an anti-abortion discourse, promoted for decades by the Catholic Church and the most reactionary sections of society, focused on defending human life. He insists on the need to respect existing agreements on this matter, saying that there must be a social consensus. In fact, such agreements have never existed, as the Church and conservative forces have always resisted any type of advance. But if such a consensus is imaginary, claiming to defend it does help underpin the new moral majority. At the same time, Casado has tried to neutralize the movement calling for historical memory of Francoism’s crimes. He has resisted its moves to remove remaining icons of the forty-year dictatorship by invoking the need for consensus and concord among Spaniards, insisting that it is time to solve the problems of the present and to look towards the future, not the past. At the economic level Casado promises a fiscal revolution based on the principles of Reagonomics. In the words of Daniel Lacalle, a free-market-fundamentalist Spanish economist, this revolution has two key aspects: first, tax cuts specifically focused on payroll and corporation tax, and second, the elimination of other types of tax considered “immoral” (taxes on wealth, donations, inheritances, etc.). The country’s real social and economic needs are thus overlooked in the higher interests of an ultra-neoliberal ideology. His neoconservative project also includes a robust attack on immigration, claiming that African migrants will make the welfare system unsustainable. This racist and politically incorrect rhetoric moves in the same symbolic universe as the discourse peddled by the likes of Trump, Matteo Salvini, and Marine Le Pen. If in Spain the 15-M movement did help resist this kind of scapegoating, it may have a second chance to break through in today’s reactionary global context. At first sight, it may seem that Casado and his populist faction are going to harm their party’s electoral interests. However, the vision that has long promoted by political analysts, pointing to the existence of a static political center which the parties simply need to occupy, is currently being disproven around the world. In Spain, the ideological reconstruction of the neoconservatives, combined with an intensive mobilization of the most hard-line forces, will increase the polarization with the Socialist government. This polarization of the Spanish political terrain has the possibility of both splitting Ciudadanos and narrowing the space open to Unidos Podemos. Moreover, things that seem impossible today, like challenging the immense advances of the powerful feminist movement, could reverse in the context of a weak government which is also submerged in Spain’s permanent constitutional dispute. Not only does the PSOE government have a precarious base of support in parliament, but the party seems little-able to articulate a program that can energize and empower its social base. Casado and the new Popular Party have a political project. And if he has no problems with the legal system, he is here to stay. Some might think that his ideas aren’t realizable in Spain today. But we should take them seriously. Especially if we want to fight him. Rodrigo Amírola is a writer for cuartopoder .